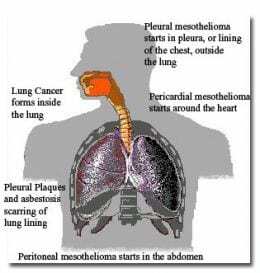 Mesothelioma which starts in the chest cavity, or pleura. Mesothelioma which starts in the abdomen, or peritoneum. Mesothelioma which starts in the space around the heart, or pericardium. Mesothelioma, or cancer of the mesothelium, is a disease in which cells in the mesothelium become abnormal and divide uncontrollably. The abnormal cells can metastasize and spread to nearby tissues and organs, resulting in malignant mesothelioma. The mesothelium is a protective membrane made of mesothelial cells which forms a sac of lubricating fluid around most organs, allowing the organs to move and function properly. The mesothelium is given different names, depending on where it is, e.g., the heart (pericardium), abdomen (peritoneum), lungs (pleura), or other organ. Mesothelioma is a rare cancer. Approximately 2,000 to 3,000 cases are diagnosed each year, but the incidence rates are increasing. Mesothelioma occurs more often in men than in women, and a major risk factor is a history of occupational exposure to asbestos. The risk of developing mesothelioma increases with heavier asbestos exposure, but there have been cases of individuals with relatively minimal asbestos dust exposure many years ago later developing mesothelioma. Family members of asbestos workers are also at increased risk for developing mesothelioma if exposed to asbestos dust brought home on clothing.